Gravitons becoming monopole gravitational waves generated from all mass and energy, a decay process of all matter. Time space and gravity are by-products of the three forces of mass in a three dimensional universe. Solid,liquid and gas, proton,neutron and electron three quarks in protons and electrons, kind of a Trinitarian universe. It's would really be funny if we were the third planet from the sun, hey- wait a minute. Water comes easily in three forms and three colors make up all the colors... What was it that Jeaus used to baptize? God does not play dice, he plays pool and the big bang was his opening shot- nice break God. Nowhere in the Bible or any other religious dogma text does it speak to earth as a living organism/Gaia. So right off the bat these books are meaningless related to the birth of anything. They speak only to us humans and far as bible goes the absurdity of that Hebrew soap opera astounds me.Religion speaks to the ego of men not a god and surely not to the goddess mother earth as the divine feminine is removed intentionally to maintain the paternity of the authors. Why do MEN discuss the birth of anything? When will human beings stop reading religion and just sit under the welkin of infinity and shut up! This universe is so huge and complex only insipid ego-maniacs like humans assume a god cares about them and that they have the power to control/hold dominion over this planet. Shame, shame, shame on you all really, become enlightened and stop reading or listening to others. They have no answers. Calling the Higgs boson the 'God' particle was a dumb idea. If it was just called the Higgs boson it would remain in the sphere of science and would be tangentially interesting to most people. Just look at the length of the posts to this thread. It is disproportionate; look at the number of posts to other leading science stories. These posts have very little to do with science and NOTHING to do with God. Too much technology, too soon for human kind! Why do people on here have to turn this "god particle" thing into a battle between science and religion? Science and religion aren't at war with each other at all. How does explaining the complexities of HOW the universe works in anyway negate the existence of a supreme being? It doesn't. I'm a devout Christian and I absolutely LOVE the idea that we have reached a point in science where we can do these things. Folks are so caught up bashing the existence of God that they haven't given pause to truly how awe inspiring and wonderful this is. It's like a car mechanic slowly unfolding to his child (as they can handle it) just how the car works, and lets them tinker with it to "discover" things as time goes by. If atheists want to even come close to winning the, "There's no god" argument, then they need to change their foundation from "there's no god" to something positive. Even if they are completely correct and there ISN'T a God, their stance is still doomed to failulure because it's foundation is based on a negative. It's amazing that a group that claims to be so caught up in science hasn't yet grasped that simple scientific truth. The difference between Faith and Science is that the first pretends to know the Truth while the second constantly searches for It. In a certain sense an Atheist claim: "God doesn't exist", is a claim of Faith (since it can't be (yet) demonstrated). But also your: "It's amazing that a group that claims to be so caught up in science hasn't yet grasped that simple scientific truth" doesn't make sense at all. The God concept belongs to the sphere of Faith! The "God particle" name was the result of censorship by Leon M. Lederman's publisher. He wrote a boke in 1993 called "The God Particle: If the Universe Is the Answer, What Is the Question?". He originally wanted to call it the "godd@^n particle", but his publisher wouldn't have it. This is going to prove Deism belief of the founders of USA, proving its mission and glorifying the Great Seal of the United States, and National anthem, which even the US citizens never wanted. You're god@^m right it will! Is it too late to change such a poorly-considered name? Now it just allows journalists sensationalize the "God particle! ", muddy the water with politics, and put the subject into public discourse in such a way that readers can remain ignorant but feel more right to their opinion. beginning of the science of Teleportation...!! Damn there's god particles in my tea. It is really difficult for the people working in CERN to admit that they failed. Millions of funds have been spent for a ghost particle. As opposed to the billions upon trillions of dollars wasted on the "holy ghost" that answers no prayers to any greater effect than that of a placebo. Please read my answer to mr Sean and Mr Robert G. below. Ok, i read your responce... what do you propose? The world population has surpassed 7 billion... airdrop condoms to the Asias and Africa? Maybe free sterilization for the masses, and we'll even let you decide who gets to propogate the future generations?... please do tell, how should we fix the issue of world hunger... the Nobel commitee awaits your reply. Please read my answer to mr sean below. It is really difficult for IDIOTS like you to understand that the damn World you're living in (with pcs, mobile phones,telecom.) depends on scientific research and not on theological research. Theological research is a worse alternative. We should spend more on social issues, for the millions of human beings starving and for the animals which are destroyed for profit. Only an idiot may think that a person criticising so called research for ghost particles is defending theological research. If one could research all of the information a couple of the most powerful religious organizations have hidden away from the public we might find quite a bit of science in theology. We have more than enough food to feed the world. The problem is in distribution. And all to often it is politics and religion that block this distribution. It seems you have an issue with this particle accelerator. Earlier research (many years ago) lead to accelerators that were linear. We learned many things. Now days, many hospitals have at least one accelerator. They're used to create isotopes used in medicine. They're used in radiation therapy. If you, or anyone you know has been treated for cancer, you should be on your knees thanking physicists and other scientists. How do you see this as failed? Looking for "Higgs Boson" is one of many experiments that are conducting at CERN. You may see this irrelevant to your daily life, but it may be important later. Who knew when they discovered "transistor-effect", that would lead to the big revolution now in many ways including socially. So I don't see how you see this as failed. Article in a nutshell: "Please don't stop our funding, we're getting closer... really.". It's not the article that needs to be put in a nutshell. 9 billion dollars spent on the LHC and the researchers need to fabricate progress to get funding. Really. I guess you are proof that it is possible to live in another dimension. I don't claim to be a scientist or have any great understanding of the galaxy, but the Cern scientists claim of alternative universes and dimensions existing in the universe has caught my interest and I think their experiment has actually worked in some weird way, as soon as the collider was turned on the US was thrown into a tail-spin politically and climatically, perhaps we have actually entered another dimension of space and time because of their experiments with physics and their attempts to create black holes with the collider....The financial world has been a black hole ever since. The never attempted to "create a black hole" they're using collisions, on the magnitude of partical collisions that occur every day on earth, they are just measuring them. ...because everything revolves around the u.s. right? Looks like they need to show something so the funding would continue. And it's time for your meds again. The really scary things are that folks like zed DS are allowed to vote, and breed. Yes and fossils where put there by Satan to test your faith, believe whatever gets you by, but please turn the caps lock off. God particle? Uhh? What??? Nobody calls it god particle CNN. Or is this just a way to please the American audience? It's called boson particle regulary and referred to as Higgs particle informally. Also not Higgs boson since there is just one boson. Simple as that. The real God-particle is the graviton, not this one. I fear such an experiment may produce `Black Hole`. I fear you have no idea what you're talking about. You claim to know more than particle physicists??? It has been said "a little knowledge can be dangerous." Your comment tends to show some of that, even though it presents no danger to anyone. On other subjects, someone like you COULD present danger of a sort. The possibility of a black hole from a collider is as close to ZERO as anything can get. And ARE you truly ABLE to believe that crockpot stuff about the world ending in 2012? Since you obviously do some reading on science matters, may I suggest that you switch from the purveyors of pseudo-science to something more solid, like Scientific American mag? The popular mags that talk about black holes emerging from the accelerator's use are pushing pure yippledung. They offer stuff like that because it sells copies to people like YOU. GULLIBLE people like YOU, who want to max out on the "Gee Whiz" factor. The real science has gobs of those, but you have to think and read a little more, after carefully selecting only reliable sources. Another good source for you, to get some good layman-level knowledge of the sciences, are the writings of Isaac Asimov. He was called "the Great Explainer." A biochemist himself, he had a memory that forgot nothing, and he could absorb all kinds of material one day and teach it the next. He was that good. But he also had the gift of words, which enabled him to put some extremely complex scientific knowledge into the heads of lay people – and he was not offering "pseudo" stuff, but the real thing. On black holes, specifically, check out the vast knowledge about them from the world's acknowledged expert on black holes: Stephen Hawking. There are videos, which are good, but there are also fake ones put on youtube by cranks, religious fanatics and troublemakers. There are books about Hawking and BY Hawking, which should feed your curiosity admirably. Your brain is yours, and it has huge capacities that even you don't realize are there. But as its custodian, you are in charge of what you will fill it with. Well said, well said indeed! You're waisting your time with a bunch of poes, trolls and conservative IDIOTS that don't understand a damn and keep complaining about where their tax money goes. Black holes of small sizes are produced and just as quickly disappear all the time on Earth. When a person dies, their soul in fact go through a black hole and exit a white hole [thus the near-death reported seeings of a very bright light at the end of a tunnel ] connecting them to next existence, whether that be 'Heaven', 'Hell' or whatever. Your claim would be all the more convincing with a bit of proof. Or do you just glom onto any far-out idea you find, regardless of the source? If so, why don't you glom onto the real stuff scientists find? Are you a science-bigot or something? Profiling? Discriminating? Have you read "Broca's Brain" by Carl Sagan? His suggestion about why people see that light in "near-death" experiences is every bit as good as yours, better, actually, since he doesn't have to rely on mysticism or what he read in some pseudo-science mag. His possibility is entirely plausible. No black holes needed – or white holes, either! The old saying, "He who knows NOT and knows NOT that he knows NOT, is a fool; SHUN HIM. Tell me, pal, are you shunned kinda often? The cure, of course, is to only comment about things where you have some serious KNOWLEDGE. Otherwise, you get shunned. H.B. What's your job on this forum ? To 'put to shame' anyone whose ideas or conjectures don't meet with your 'quality standards' ? Speaking of Carl Sagan, wasn't he the one who openly (yet naively) welcomed contact with Aliens, while, on the other hand, Prof Stephen Hawking begs to differ ! I had a near-death experience and felt the same way as I had described on black and white holes. Perhaps it was caused by some misfirings of my neuron synapses or oxygen deprivation to give that experience..who knows ? Nonetheless, I don't have to clear my perspective through a peer review by eminent scientists to post here, thank you very much ! Don't call it God particle, whoever called it that is silly. I'm sure steam power frightened people too. Read the post above from H. B., written December 13, 2011 at 11:53 pm. Do as suggested, you will be better for it. The notion that an ancient people could predict the end of the world 5000 odd years down the road, but could not predict their own demise, is just, well, ludicrous. its a small, small world! As we have witnessed through quantum the seeker will create the sought. When indigenous tribes of the south pacific demonstrated by building replicas of WWII US airplanes out of wood to coax down the "Gods" that once visited them with cans of Spam, you see what you expect ...and you expect what you see to return again, ummm love that spam! God is not a "particle"! He is a matterless Spirit! His Son, the Spirit of the Father celebrates His birthday in ten days! When the Jew by the name of Jesus was born in Nazareth, to Jewish Mother and the Holy Spirit of Yahweh, the world had changed forever! First and foremost, because of His sacrifice on the Cross, we no longer die! This is why I am anxiously awaiting Jesus Birthday on December 25th! And this is why I am proud of having some Jewish blood through my Chassidic roots. What is momentous in Christmas, is that it is the Nativity of the Son of God! The Word of God, spoken by Isaiah 9, 6, has become the only ruler of Israel! The Jewish people "have seen a great light," the very light that has created the world! We Christians celebrate the coming of this Light, each Christmas. It is a source of an immense blessing for humanity! Six billion people can now say, "we will never die"! There is no greater feast on earth, than the feast of our eternal life! It's the greatest reason for rejoicing, especially for those who were dispossessed and tormented in this life! Blessed Christmas to all! Humankind, including the mad scientists! ffs man read a little. they're not calling god a particle, they're not calling this particle god. it's a sad mix up that coined the term "god particle" in the first place and is not relevant at all to this article. please don't use the term "god particle" as an excuse to preach. thank you. the responses from believers was not to take it as a chance to preach, maybe our fried went way beyond, but a response to those who assumed and stated that the article says that it disproves god. The Bible tells you especially in the Gospels to WAKE UP. They calld it "the God paticle" because, if it exists, it is the foundation, the "force" that makes the universe exist (have mass). They meant no disrespect, just a metaphor... By the way, Father, Son and Holy Spirit, the Holy Trinity, is just a metaphor for Universe, Life and Laws of Physics/Evolution, as penned by 320 intellectuals for Constantine in Nicea, in 325 AD, but don't tell anyone! Ssschhhh. Ali...follow your own advice and read the bible. Jesus is a Jew! He is not returning to destroy Jews, but to establish a new reign over the earth. Moving on...the sad fact is, scientists are wasting their time trying to explain something that we Christians are well aware of. God created the universe. Period. All this other mumbo jumbo will continue to be proved wrong over and over...as much as they are the smartest brains, they can't get over the loopholes. Genesis 1:16 God made two great lights—the greater light to govern the day and the lesser light to govern the night. He also made the stars. God set them in the expanse of the sky to give light on the earth. The stars gave light to the earth immediately, although the closest star, Alpha Centauri, is 4.3 light years away. So the very first star light would have taken 4.3 years to reach earth. The light we see from the Andromeda Galaxy takes 2.2 million years to reach earth, which also debunks the argument that the earth is only 6,000-10,000 years old. Genesis 1:11-12 and 1:26-27 Trees came before Adam. Genesis 2:4-9 Trees came after Adam. Genesis 1:20-21 and 26-27 Birds were created before Adam. Genesis 2:7 and 2:19 Birds were created after Adam. Genesis 1:24-27 Animals were created before Adam. Genesis 2:7 and 2:19 Animals were created after Adam. Genesis 1:26-27 Adam and Eve were created at the same time. Genesis 2:7 and 2:21-22 Adam was created first, woman sometime later. Genesis 1:31 God was pleased with his creation. Genesis 6:5-6 God was not pleased with his creation. Which raises the question, how can an omnipotent, omniscient God create something he’s not pleased with? Genesis 2:3 Then God blessed the seventh day and made it holy, because on it he rested from all the work of creating that he had done. God placed temptation in the direct path of his two naïve children and allowed them to be tempted by the serpent (Genesis 3: 1-7), resulting in a single mistake that would contaminate hundreds of billions with a sin nature worthy of eternal torture? Genesis 3:1 Now the serpent was more crafty than any of the wild animals the LORD God had made. He said to the woman, "Did God really say, ’You must not eat from any tree in the garden’?" A talking snake. Enough said. God acts in mysterious ways, just like subatomic particles! HAAHHAHAHAHAA! "because of His sacrifice on the Cross, we no longer die!" So you meen Moses didn't go to Heaven since he died BEFORE Jesus was born!?! Jesus died for the past, present and future sins of all mankind. Moses is in heaven. If you don't believe in heaven, keep it to yourself. It was a theological question. What the phoque is a theological question doing on a SCIENCE blog? You forgot about the easter bunny and santa claus, and the tooth fairy as well. It's called the God Particle to apease frightened Christians who fear science because it threatens their delusion...er...faith. Hopefully they won't vote down funding of real world progress and understanding as they attend their tax exempt churches and work tirelessly to stop the teaching of Bilogy (evolution) in our classrooms. it seems you have found your god. that explains in what you believe. it stinks to me. please hurry up and finish it so the military can use it kill all us all! It is incredible how just the mention of the word, God, brings out all the anti-intellectuals. Obviously many, many people are interested in knowing how the world works, but not the religious zealots who somehow think that using one's mind to understand our world is wicked!. they don't think the mind or it's use is wicket – it is just limited to the physical world, which they too understand. some of the best minds in science have been and continue to be believers. I have seen the "God particle". I call it "Tim Tebow" though. Rolls off the tongue better. Tim's next job will be preacher. Have his own big tele-church. My favorite scripture is Sec Championship verse 2009: Tebow wept. 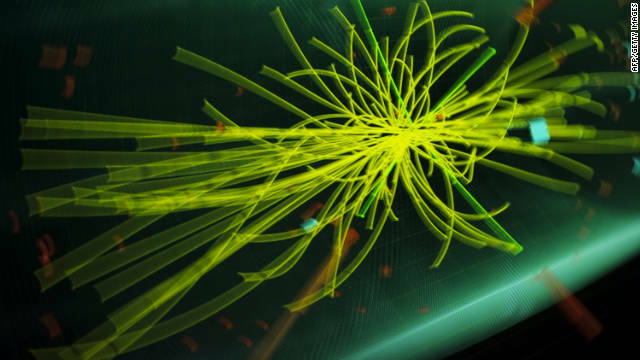 Just stop calling the Higgs the "God particle." Please MSM. You haven't the faintest clue what you are talking about and it's misleading millions of theists. the term "god particle" has done nothing but confuse people. One god particle is Jesus Christ, who ended up on a stick. Maybe there were trying to determine if he was Higgs boson. They have found "nothing". This is not news worthy. This is VERY newsworthy. They have found that there appears to be a particle that they were not sure existed before. If it is repeatable enough times then they can say it definitely exists. This has HUGE implications in the particle physics/string theory world. "we already know that god made everything that is known and unknown"
You are silly goose billy. God made nothing. We already know that. Actually, that's not what they are saying at all. That's a very bad metaphor. By looking at all the different pieces of the puzzle, they can see how it's put together and what it looks like. It's not too dissimilar to forensics - looking at the available pieces and putting it all together based on the evidence at hand. The purpose of these experiments is not to prove or disprove that God exists - that's not the goal of science. It is to see how creation is put together and how it works. This work has profound implications for physics, and it is very exciting to learn how they are going about solving this great mystery of science. We do not know that god made everything. The only evidence of that is a bunch of people saying it. Science at least has evidence to back its claims and conclusions it can draw through analysis of data sets like CERN is collecting. Prove that God made the universe and I will believe. Prove that aliens abducted people, and I will believe. Prove ghosts are real, and I will believe. The position on a god's role is the same as anything else in this universe: until there is evidence to prove it, no rational person should believe it. "well, we already know that god made everything that is known and unknown, seen and unseen, capable of being measured or infinite"
Please explain how you KNOW this because I am sure you do not have some special intelligence that allows you to know the unknown. The "God" particle will not determine if there is or is a God. That is a separate argument based upon "In Fides Sola" (By Faith Alone)- or in the case of Santa is seeing=believing or is Believing=seeing....do you belive or not believ because you have had or haven't had a "connection" (seeing, hearing, feeling) or do you just believe that the sun will come out tommorow (you have no proof that it will, but you believe it will). Some people believe in a higher power/ some believe in society, George Carlin belived in the Sun and Joe Pesci, while other believ they will have another drink. Any of these, based upon your feelings, could be concidered "God". I'll consider this a 'god particle' if, and only if, they can create something out of absolute NOTHING! They are working to collide particles, but that's using something. I say create a vacuum and let it sit there, then if a whole universe is created out of nothing, then you have it!!! whos to say that the big bang wasnt created from two particles colliding? Amazing how they can find something like this but can't find one single brain particle in the entire 2012 GOP presidential line-up. Couldn't find one in Obama either much less the people that voted for him. Awesome science.....congratulations coming soon to the folks at LHC and around the world who have, in collaboration, accomplished so much. Just one more tiny glimpse into the amazing creations of God. The actual "god" particle is the photon. Physicists sometimes get so carried away with blasting things into their tiniest particles that they miss the real goal entirely. No, the "god" particle is the Higg's boson. A photon is a photon and can be directly observed. If they find the God Particle will they also find the Anti-God Particle,.... are we in any kind of trouble ??? ....... ........ There...I found it for you. The God particle is right there on the left. Its the one that come in between all the ones that actually exist. Now worship it. Why don't all the jesus nazis stay out of this. Because we can't... Like Paul in Ephesians we are Prisoners of Christ Jesus. The Good News will be told. how does Jesus have anything to do with nazis? he is God, nazi's were atheists..
Hahaha. That's a joke, right? Yes, Nazis were atheists.. so much so that they literally marched around with buckles on their uniforms that said "Gott Mit Uns". Translation: "God With Us". You are simply historically inaccurate. I think the end of belief in God will require biological evolution to reduce the frequency of those in the population whose brains were hard-wired to believe in an authority figure (GOD) to allow them to be good followers of God's representatives on Earth. They were literally born believers and their upbringing led them to the exact beliefs they have now. But they have almost no choice, their brains were made wired to have the behavior of believing in God, much like gays are born gay. The purpose of science is NOT to prove or disprove religion. It's only purpose is to understand how things in the universe(and maybe someday alternate universes) work. It can never disprove the existence of a god. It does – thats why it called "Gods particle". If they find and catch that matter they would say "See – this is God's particle. This particle created the world, not God". Best post of the thread. Thanks for sneaking in a little sanity. Actually, "Me," your assumption is incorrect. It's called the God particle because it serves as the foundation of unifying the various subsets of physics equations that govern the known universe. It is theorized to be both ubiquitous and elusive, just as God, and is thought to be the most fundamental component of matter as we know it. Its reference ("God particle") is an analogy that only coincidentally puts modern day geocentrists into a frenzy. So that's how it got the nickname. Thanks for explaining that, NT – none of the other articles I've read even address it. I agree. Science wasn't the result of putting up a fight to destroy religion; yet science has been making great strides in being a more honest, gracious, fun, and enlightening lens to understand the world around us all than of (especially) monotheistic religions. Religions similar to Christianity will be slowly changed and contorted by society itself until quite possibly the only real message left will be similar to the golden rule. The stories of Arks and resurrections will be left as markers as we all grew to understand each other and the real world we live in. God created science and the curiosity that each one of us has as human beings. He is the master of all creation. Probably we will respod the same way when science proved that the cell is not a simple 'blob' of protoplasm like Charles Darwin said it was. "God created science and the curiosity that each one of us has as human beings. He is the master of all creation." God created science yet there is no mention of science in the bible. And 1500 years ago, people were afraid to enter the scientific community simply because Christians would kill them for thinking critically. that is silly. thier work is like saying that they may have found a way to shine light in an otherwise half dark room and will prove whether there is something in the dark side of room that influences the the light and prove how the other lighted side is influenced by the darkside. well, we already know that god made everything that is known and unknown, seen and unseen, capable of being measured or infinite – including the whole room, the building it is in, the planet the building rest on and the space and dynamics that allowed big-bang to happen. Never going to happen. Science disprove the God that made it possible to exist. The very fact that we are discussing this with thoughts, judgement, anger, and love is proof to me that God exists. The discovery of a particle. Sadly, from what I read it is not likely to be proven. Atheism is religion. Get over it. You have your fingers in your ears again. Atheism is to religion as not playing football is to sports, or not collecting stamps is to hobbies. Ahh yes. Maybe when we finally evolve out of all our emotions. Finally when there is no such thing as happiness, sadness and hope. We will finally become atonomous organisms with the only sole purpose is to survive and procreate. No more searching for meaning in our life and the universe. Johnny 5, we need religion. It is the only thing that keeps people who do not have an internal source of morality from killing those of us that do. I don't think they should call it the "God" particle, as this is offensive to those who believe in God. It's called the Higgs boson, in the physics community, and I have never heard it called the other name. No need to sensationalize unnecessarily, CNN. If my believing in an Almighty God and his Son Jesus offends you, you can also use the red x button.Whether you believe or not does not offend me. That is your choice.I'll pray for you. I am tired of those idiot scientists and things like you. They say "Lets build and see what it does" Neither them, nor you have the idea what this "smasher" does – yet scream "Go Go". Just plain stupid. Actually, Bill, I'm pretty sure those "idiot" scientists have a pretty good idea of what their multi-billion dollar atom smasher does. You can read their descriptions in almost any science journal. Be careful about assuming other people lack knowledge just because you do. These scientists know exactly what this particle collider does. And I have a pretty good idea about how it works. Just because you don't want to take the time to learn or are just to stupid to understand doesn't mean you should be responding to anyone's post about it. In fact, you should just attempt to educate yourself and not post stupid responses to things you don't understand. This is the nickname of the particle in a community much more extensive than CNN sensationalism. Often I find those who believe in God offend me on a regular. Just saying. It's what people call it. Get over it. Or ask God to stop it. I'm afraid this Higgs boson might turn out to be immaterial thus undiscoverable by science. Something akin to the inside of the black hole where singularity or immaterialism can be found. They just have to acknowlege that not everything in the universe is matter. Science spares no expense trying to disprove God. nowhere has it said they are trying to "disprove" god...because they aren't. i mean there is the possibility that may be a sideline casualty but its not their intent. Looks like they are trying to prove him, not DISprove him. Religious fundies (distinct from spirituality in general) spare no expense in demonizing science. The Higgs-Boton is not an attempt to "disprove God," but to unify the seemingly arbitrary behavior of the different forces at work in the known universe into a unified theory. This was the goal of Einstein's life, although he never reached it, and Einstein was certainly no atheist. It's called the "God particle" because, through it, the universe could be described through a single governing equation as opposed to several subsets. Nick, you sound like an intelligent, reasonable, well educated person. So what are you doing here? It is true, science does not spare any expense at all trying to disprove the existence of God. No money or time is spent on it at all. Scientists are smart enough to know that you cannot logically prove that something does not exist. We prefer to spend our time and money working on things that we can prove DO exist. Science works. Your ability to read this message proves it, because you need a device that is based entirely on chemistry and physics to even see it. When your computer or cell phone turns into a demon and flies away to Hell, let us know, and please, provide pictures. A few months back, t CERN said it is unlikely Higgs boson exists—perhaps a 5% chance, so what's this? Science or spin science? science changes practically every couple days...does it surprise you that in a few months they went from doesnt exist to here it is? Funny, a few thousands years ago everyone knew the Earth was the centre of the universe. A few hundred years after that, everyone knew the Earth was flat. Imagine what we as people today deem impossible will realise IS possible tomorrow. It comes from men in black. Are you suggesting that in the light of discovery, they suppress the truth and stick to the 5% statement because that is the only way to stay consistent? Either you are scientifically ignorant or a Republican. Confused. Am pretty sure those aren't mutually exclusive (quite the opposite, in fact). Agreed. That's should be an and/or. RIGHT ON! ALL OF IT WAS AND IS CREATED BY GOD!! Classic! This is the hail mary of particles! How many of these are stable elements? All of those are elements fit perfectly within the laws of physics. potentialy ALL of them could now or could have existed naturally but most of them have a half life of .02 seconds thus are no longer around in nature. When man makes a particle that throws the laws of physics out the window we can truly call it man-made rather than man-ufactured. When we have made a particle that makes left be right up be down or time be the same color as potato, then we could call it man made. I wonder if this group of researchers are the same bunch that came up with cold fusion? Uh, no. Those were geniuses right here in the U.S. of A.
Nope. There is absolutely connection between Pons and Fleischmann, the "cold fusion" guys, and CERN. There is also no connection between "cold fusion" and the Higgs boson. If, as it appears, your intent was to draw an analogy between one pair of incompetent and deluded electrochemists pretending to be physicists the people and work being done at CERN, EPIC FAIL! I know a Physicists reply when I see one. The discovery will be verified in 2012... COINCIDENCE??? Yes. Seriously, this is awesome though. Science! I recommend the "God" particle be renamed the "Athiest Particle". Face it…this particle could potentially open up a world of greater understanding as to how the smallest elements of the smallest elements within the universe operates and you will STILL have people standing on street corners holding a bible stating "in the beginning, God created the universe" – come on. No 21st century, logical thinking human being will ever be satisfied with that statement. It's the most simplistic statement ever written by the hand of man. When – In the beignning. That's all you need to know. Where – Doesn't matter. Don't worry about it. Why – To act as a silient and invisible mentor to the people of Earth. But when you think about it, the people who wrote the Bible didn't know the Earth was round or rotated around the sun, which in turn, rotates around the centre of the milky way galaxy, which in turn is home billions of billions of billions of stars and planets which in turn is one galaxy out of billions of billions of billions of billions of galaxies that can be seen using today's advanced technologies. But that said, don't worry your little self about – God created the universe. Amen, my Canadian brother, amen. Could not have said it better myself. Yes, there's no way an all-knowing and all-powerful God could possibly use science to make the universe. If I can't understand it, it must not be real. I will add to that statement...If people can't understand it, God must have done it....it's just THAT SIMPLE. Look at the ancient populations of history. Greek, Egypt, Norse...they all had Gods for every possible natural wonder and feelings. They built temples, made sacrifices, statues, celebrations all in the name of Gods they created. Do we 21st century refer to the a hurricane or 100 year wave as act of Poseidon?? Do we offer sacrifices or prayers in hopes Poseidon will save us from destruction? Perhaps the people of New Orleans should have sacrified a 1000 heads of cattle to save their city from Poseidon's wrath in 2005....???? Better, maybe the national weather service should offer a 1000 heads of cattle and build a temple in along the Coastline, in honour of Poseidon in hopes hurrican season won't happen. Please. Our 21st century ignorance is really humourous. We look at these civilisations and their Gods and say, "oh how cute, they built a temple in honour of Poseidon, or Apollo, or Neptune or Rah, or Ares or Aphrodite". Guaranteed in 1000 years time, civilisations will be looking our present day society and will say the EXACT SAME THING ABOUT US. Really... So, is that why whenever scientists can't describe something they shield themselves under the cloak of "singularity." And, I am to believe everyting came out of "infinitely dense", "infinitely small" perfect sphere that somehow exploded into big bang... Ok may be God did that, I agree. The point is God will just keep teasing us... I am not against science because we made science. We agreed on numerals that describe quantification. May be if we agree to a different numbering system we would not have those mysterious strange numbers like pi, boltzman's, or planck's, etc... So, stay grounded otherwise, if you're overwhelmed by your wits you may end up in a wheel chair...like you know who? Humans have evolved so that many in the population are predisposed to believe in God because of selection for that trait (belief in God gave a survival benefit by either improving the survival of the group or allowing the group organized by religion to kill off those who did not believe). There certainly is variation for this trait, and many people don't inherently believe in God through a genetic predisposition, however, some believers have been trained to believe. The important point is that you can't expect people who were born believers to not believe in God anymore than you could expect people who were born gay to stop being gay. Let's have some understanding that we should treat each other believers and non-believers with respect. Just a little insight to the name "god particle". Scientists are not trying to replace God in any way. In fact it could be a way of praising God in that the name was given because of the hopes that by finding the Higgs Boson, the "god particle", they will begin to understand how mass came about. If there were no mass we would not exist. In short it is a pinnacle in the study of science not a replacement of any religious ideology ( God) ). I'd like to replace god. you can't. he is there. you can try and deny it but how do you explain morality? how do you explain life? where did it come from? make excuses. it will only hurt you in the end.. Finally gonna prove that God is an imaginary being created to scare people. I love it. Bye bye religion. How would this disprove God? The burden of proof, not disproof, is what makes the idea of God sound so silly. The fact that the creation story lines up almost perfectly with the big bang theory is good proof. And since it is Rod in Dallas Texas who expects this discovery to disprove God, it is his burden to explain how it would disprove it. Amen brother Michael... I agree with this statement: "The fact that the creation story lines up almost perfectly with the big bang theory is good proof"
Once again people... you are only witnessing God's creations. Did a scientist create this? NO... God did!! I agree. How would this disprove God? How do you know god created everything? What if it was a giant spaggetti monster that created everything? Dont pretend to know when none of us know. Don't strain your brain too hard, Converted, you might actually do some critical thinking. Critical thinking like Romin256? I will stay with God!! Please don't think I am being naive... I was once agnostic leaning toward athiesm... I used agree with the athiests out there... Then Jesus found me in a very real and powerful way... I belive in spirts... I belive in God and Jesus Christ... There is a good chance you will be converted also some day. Peace be with you. Some things just can't be explained, such as God. If the big bang theory were true, then how did those gases and explosion happen? Where did they come from? If the universe is expanding (and not infinite), then what is outside of the universe? Existence (and God) is something that will never be proved by any lifeform. Ever. But it will never be disproved either. Thus let us believe what we want through our roots and personal experiences/miracles with God. What if photons decay over time? What if the red=shift isn't the Doppler Effect at all? That is to say, if you bounced a photon back and forth between two mirrors in a laboratory for 5 billion years would you observe a red-shift identical to the red-shift of observed light coming from distant galaxies? Is the Big Bang Theory so weak that imaginary paricles, energy, matter and dimensions have to be fabricated to make it work? From what I see, CERN could be spelled with just two letters B and S.
I would recommend reading more. Your problem is that this can easily be tested over much shorter time scales, even down to fractions of a second. It would certainly have been noticed in all the experiments done. Also, how then do you explain blue shifts? Are the photons 'anti-decaying'? Rather than photon decay, it is more likely that there are actually two time dimensions as predicted by string theory. The second time dimension, only detectable at extreme speeds or in infinitely small space accounts for the red shift and also would dispel the problems with singularities. If i'm understanding what you're saying right, wouldn't photon decay break the law of conservation of energy? "...it’s very likely we might get an answer that we could consider solid." God is Love. More than this we can not ask. True. Not until that "love" thing starts to take effect. If anything, we are a patient people. Be sure to watch the video as he explains how we can actually use this new technology/discovery. Science, recognize. I open they hurry up. All the other gods I've been praying to don't seem to be listening. ^ – I hope they hurry up. (I blame the type god for that mistake). PLEASE stop calling it the God particle for emotive appeal. If people can't appreciate the theory for what it is, it's their loss. Stop trying to make science a comic book. Sorry, guys. My daughter posted that. I've always called it the god particle. Sorry again guys, that was my wife. She's a nag; forgive her. If they are not actually observing it, but observing the effects it has on other particles, how do they know it is the hoped for Higgs boson, and not some other as yet undiscovered particle or energy? Conserving the integrity of the tool and discipline of science is important. Observing a "bump" on a graph is not quite the same thing as observing the particle itself. Kudos to the scientists who are doing this painstaking and tedious research, their efforts are to be lauded, regardless of the outcome. Zeus had an origin and even had parents according to the mythologies. Almighty God has no origin, but is eternal, and is the origin of all creation. If the Higgs boson is believed to be the original particle, or the most base particle of matter, the "God" particle makes sense. If it is a particle of great power, but has something preceding it, then the Zeus particle would make more sense. However, just calling it the Higgs boson would make the most sense; it just doesn't have the same impact. If it does what it is expected to do, it is what it is. You can name it anything, but the effect will be the same. If you cannot see it, how do you know what is the cause? The Higgs boson could be 4 more steps beyond what is being measured. Science requires observation and confirmation. If you cannot observe it, but can only measure some effect, true, something is causing the effect, but you cannot actually say with any scientific certainty it is what you claim unless it can be observed and confirmed. Observing a "bump" on the graph is not the same as observing the particle. The "bump" is a measurement open to interpretation, the particle is the particle. "It is what it is" but may not be what you believe it is; perception is not always the same as reality. Something may be there, but it may not be the something you expect or claim. They haven't actually observed many particles. Once you get small enough light no longer hits things because the wavelength is bigger than the thing you're looking at. No fermion or boson has ever actually been seen but their effects are. How do you know what the Sun looks like? All you can see is the light coming from it. How do you know gravity exists? All you can see is its effects. That's poor thinking. Wow! No matter which theory prevails the particle that started it all came from somewhere, or the energy that created the particle came from somewhere. And this particle found it very important as to what hat is worn and when. You you mind reposting your comment in English? The name is stupid because there is no God, bear0402 is correct that science cannot be argued and will always win. Stop believing in an imaginary figure and get on with your life. Religion was created to dupe people into giving their money to a snake oil salesman. Except that science and God are not mutually exclusive and religion has been around since before currency. You must lead a very sad existence. Some folks may remember what the first cosmonaut said upon his return to earh. Ahhh, there's my left sock! Thanks Jesus! OK – so exactly what is this so-called "God particle"? How does it inform us? The article fails to explain that. I guess I'm just a dumb old Iowa Boy, because I'm not familiar with sub-molecular physics and it's impact on scientific reasoning. Thank you! I read that whole thing and still couldn't figure out why I should care. There's a good chance the author has no idea himself. From what I understand, finding it would help to confirm the Higgs mechanism, which is one way of explaining why particles have mass and don't remain mass-less energy. The article isn't meant to be a complete course in physics. Get a hold of Fabric of the Cosmos by Brian Greene for a good start in understanding physics for beginners. If you're just a dumb Iowa boy, why did you come here to read this? If the article doesn't leave you informed, or knowing why you should care, please note that pleasing YOU wasn't on the author's agenda. If it's confusing, there's a cure. Bone up on the subject. There are many fine books in the library and in stores which could help you grasp some of it. Particle physics is probably the most demanding and difficult science of all. Articles like this are for those of us who DO know a wee bit about it and are interested in learning more. I'm one of them, and I'll freely admit that I am still profoundly ignorant of what particle physics is about. What I DO know is that they are learning things about how the cosmos assembles itself, what the nature of matter is, and I know a few things about how they're going about it. One thing is for sure: it is important research. And I'd also know better than to presume I know more than the researchers do. I might have questions I'd like to ask them, naturally. Why not hit the library? Learning never hurt anyone, of any age. Ignorance isn't anything to be ashamed of; curing it can be great FUN. It starts in libraries and bookstores, and the fun comes from learning from what you read. Try it. Science says things like: "Scientists ... said they had made strides in their search for the Higgs boson but did not have strong enough conclusions to claim a discovery." Whereas religions says things like: "THIS IS THE WAY IT IS AND THE WAY IT ALWAYS SHALL BE, AND THOU SHALT NOT QUESTION IT!" Ever heard of an Axiom. It's a mathmatical term. Axiom is a rule or a statement that is accepted as true without proof. An axiom is also called a postulate. Sounds kind of similar to your statement, "THIS IS THE WAY IT IS AND THE WAY IT ALWAYS SHALL BE, AND THOU SHALT NOT QUESTION IT!" The Higgs is a figment of physicists overactive imaginations. The Higgs does not exist. What does exist is errors in our current understanding of the universe. No more or less than the religious explanation that god created everything. Heavier-than-air aircraft cannot fly. People will suffocate if they try to drive more than 30 miles an hour. The lightbulb cannot work because all light must come from combustion. the rocket cannot fly in outer space because there is no air for the exhaust to push on. Etc. etc. etc. The scientists have always been crazy, because noew ideas are bad, just figments of the imagination. No wonder convervatives are the enemies of science and progress. Easy E, this has nothing to do with politics whatsoever. Our fundamental understanding of the universe is flawed in some way. We now have mathematical equations that give bizarre results using our current theories. And too many physicists have been led down this path of creating concepts like Higgs, dark matter, dark energy in order to try and shoehorn our current theories to match the experimental observations. We need to revisit our assumptions. And what do you propose as an alternative? Please don't say "goddoneit"... we've heard that one before and nobody believes it. Present your credentials and your alternative to the peer review process, or STFU. Higgs bosons, dark matter and dark energy are imaginary. They simply don't exist. The only reason we are talking about them is because of an irrational refusal to consider an alternative cause for the observed red-shift of distant photons other than a doppler shift. This so-called breakthrough is nothing more than mathmatical mumbo-jumbo with no basis in fact. It is equally possible that the Universe is infinite in time and space or there was a Big Bang, but not both. FThe failure to consider and reconsider alternatives to the Big Bang Theory is a flaw of the basic scientific method. Pasteur and Galileo were true scientists who questioned prevailing theories, CERN workers are no't. So put your money where your mouth is and publish a paper. Right, so your complete rambling makes them fake. Evidence? Can we at least see a high school diploma? Or did you take Bible studies? CERN workers know more about science, experimentation, and the scientific method than you ever will. There is a solid mathematical model that supports the existence of these particles and well as evidence from other experiments. The mathematical models explain the behaviors they have seen in experiments so far. From basic research, they have concluded that this is the next logical step in their search, and there will be much more work after these experiments have finished. All the evidence they have found so far has pointed in this direction. Read a few of the papers in the scientific journals. This is not the lack of imagination, it is the height of human ingenuity. Stop calling it the god particle – nobody really calls it that, and it sounds stupid. It's not any more important than the other subatomic particles, its just the last one we have yet to figure out. Seriously... They just want to stir up some controversy with the religious sector. Leon Lederman originally wanted to call it the goddam particle but now is commonly called the champagne bottle particle. Yup, you knew the news would come out, after spending sooo much money on the hadron collider, you know they wanted to come out with something..anything.. to show they didnt waste all that money, although,, they did.. HA! Quit calling it the god particle and appropriately name it the Zeus Particle. Thankfully, this scientific research is beyond the reach of the American Conservatives and American Politics in general, so they can't skew the results to serve their narrow minded views and goals. Science will always win in the end. and when it doesn't, then what will you do? Ignore is because you know it is nothing more than a bunch of B.S. It already has. Deal with it.